SMART Broadband, Inc. (SBI) has unveiled a USB modem that will allow users to access the Internet with speeds ranging from 384 kbps to 768 kbps anywhere where there is a Smart signal. The device will be offered under SBI’s “Smart BRO Plan 799.�? Under the plan, which costs P799 a month, subscribers have 60 hours of Internet usage per month and will be charged P10 for every 30-minute block in excess. MOBILE INTERNET. 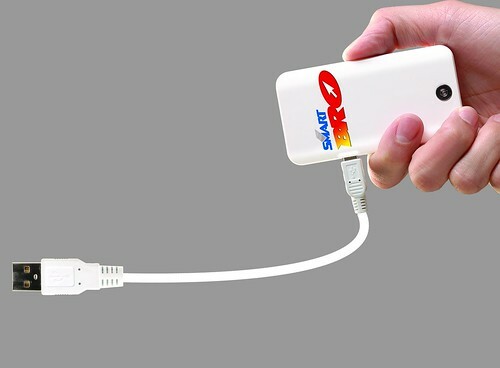 The Smart BRO USB modem allows you to connect to the Internet anywhere where there is a Smart network coverage. The device is offered under a P799 monthly plan. Click on photo to enlarge. When I first read the press release, I was immediately tempted to get one. But it’s not something I need just yet. I rarely go out right now and at any given hour I’m either at home or at the office or on my way to either place. Still, it’s certainly something I want. People who are always on the go, however, will find the device useful, especially in areas with sparse Wi-Fi coverage.